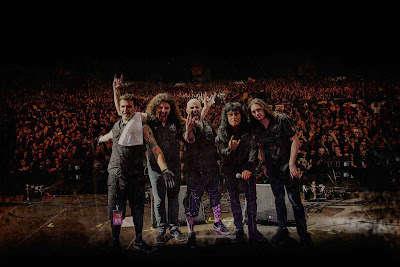 Anthrax are streaming video of a performance of their 1987 classic, “Indians”, as the latest preview of their new live DVD, “Kings Among Scotland”, ahead of its release on April 27. The tune was the second single from the New York band’s third album, “Among The Living”, which Anthrax delivered in its entirety during the 2017 spring tour alongside a fan-voted set of favorites. "It was a challenge for all of us to play 'Among The Living' live," admits drummer Charlie Benante. "We've played a number of that album's songs in our shows over the years, but not all of them, and playing a song in a recording studio is not the same as playing it live on stage. So we put in a lot of time to get all of the tracks down perfectly. “And I'll tell you, after we finished that set, as arduous as it was, we all felt a sense of exhilaration, like we could go out and do it again." Directed by Paul M. Green, “Kings Among Scotland” captures Anthrax live before a sold-out crowd at Glasgow’s Barrowland Ballroom in February of last year. The band recently wrapped up a co-headlining tour of North America with Killswitch Engage and will next be seen playing a one off show this Friday, April 20 at the Pima County Fair in Tucson, AZ. Anthrax will support Slayer on the group’s final North American tour when it launches on May 10 in San Diego, CA alongside fellow openers Lamb Of God, Behemoth and Testament.